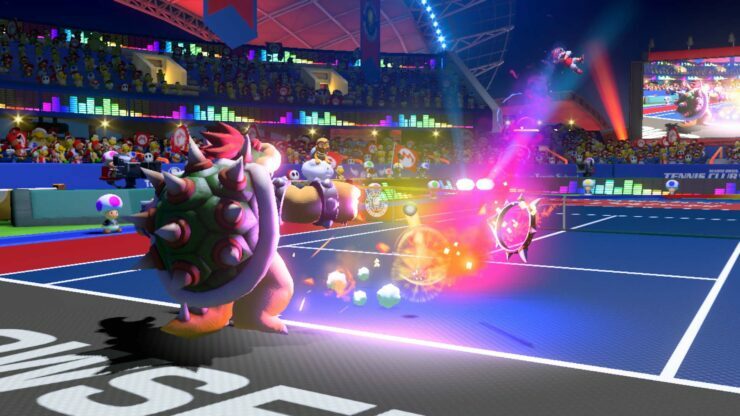 Nintendo has released Mario Tennis Aces update 2.2.0 for the Nintendo Switch which adds hosted matches and offers numerous changes alongside the return of Co-op Challenge Boo Hunt. -You will still be able to choose All, Stadium Only, or Custom. ◦The character-selection screen for Online Tournament, Standard Class, and Simple Class will start with the cursor on the character you used the previous time. ◦Changed the menu flow after Online Tournament match is done. ◦Changed amount of Energy increase from pulling off a successful block when Doubles Partner is using Zone Speed to half the amount of a successful block without the use of Zone Speed. -Using Zone Speed in Singles and pulling off a successful block or Trick Shot will not restore Energy, but it will restore Energy when your partner uses it in Doubles. ◦Added Shot Button + X Button to Powerful Shot controls. Press the A Button and X Button at the same time for a topspin Powerful Shot, press the B Button and X Button at the same time for a slice Powerful Shot, and press the Y Button and X Button for a flat Powerful Shot. ◦This Co-op Challenge will be available again from the distribution of Ver. 2.2.0 until 9:00 AM on March 1st, 2019. Co-op Challenge is a mode for online play which will only be held for a certain period of time. – Nintendo Switch Online membership is required to play Co-op Challenge. -You can acquire three different-colored Boo visors by achieving objectives. ◦If there aren’t four total players, the necessary number of COM players will be added after a certain amount of time has passed. ◦Added the Hosted Match mode which allows players to easily compete against each other in singles matches through LAN Play or Online Play. ◦Besides the two players in the match, an additional player will participate as the host and control match settings as well as which screen to show on the monitor. ◦Three Nintendo Switch systems are required for a Hosted Match—one for each of the two players and one for the host. -LAN cable (sold separately) is required for LAN Play. -Nintendo Switch Online membership is required to play an online Hosted Match. Players must also be registered as a friend on the host’s Nintendo Switch system. ◦Access the Hosted Match mode from the main menu by pressing in the Right Stick while holding down the L Button and R Button at the same time. The host will select Host and make a room, while the players will select Player and join the room created by the host. -A LAN cable (sold separately) is required for LAN Play. -All participants must decide the date and time, rules of play, and game progression amongst themselves before the actual match. ◦After all three participants are ready, the host will control various settings and game progress. ◦The host’s screen will be split left and right, showing both P1 and P2 play. (Players’ screens will not be split.) Pressing directional buttons during the match will change the host’s screen: Up Button for split screen, Left Button for P1 screen, and Right Button for P2 screen. 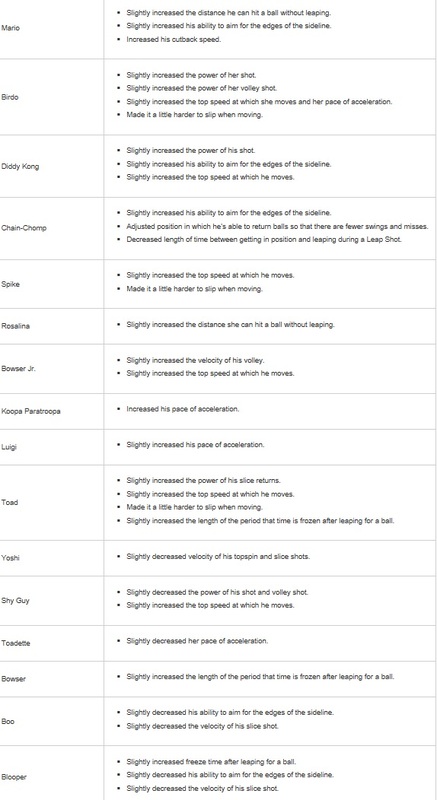 ◦The characters that are available to play depend on the respective game progress (save data) on each system. ◦All courts will be available to play regardless of respective game progress on each system. ◦The host controls whether the first to serve will be random, P1, or P2. ◦The host controls whether the character-select screen of each player is visible to the other. ◦The host can select whether the menu can only be controlled by the host, or whether players can control it too. ◦Made adjustments to visibility of the ball in Bask Ruins, Piranha Plant Forest, Mirage Mansion, Snowfall Mountain, and Savage Sea. ◦Improved AI for COM players. ◦Decreased amount of time that controls are locked while saving the game. ◦Adjusted Koopa Paratroopa’s flying animation. ◦Changed the angle of Rosalina’s hair before she serves when playing left-handed setting. ◦Adjusted height that the ball bounces after hitting a drop shot in The Great Mirror Mystery mission and Adventure mission. ◦Other adjustments have been made to improve gameplay. ◦After you download the latest update, you won’t be able to do Local Play or LAN Play with someone who is using previous update data.